Thursday afternoon the creek in Timber-Linn Park was still running bank-full. It’s not often anyone is tempted to write a headline like the one above. 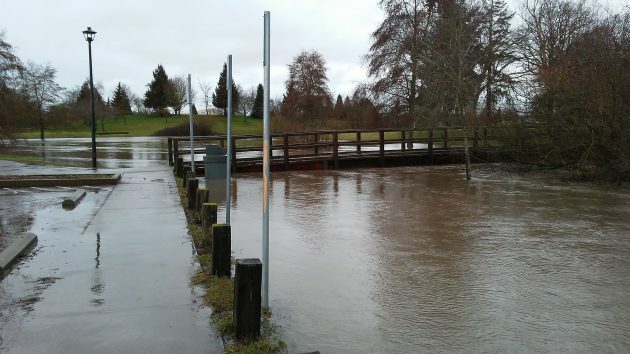 But it came to mind after a day of unusually heavy rain in the Albany area, where heavy rain in February is not exactly big news. The Albany Public Works Department reported that more than 1.6 inches of rain had been recorded between midnight and 7 a.m.. And then the drops kept raining, though at a less furious pace, for the rest of the morning. The heavy rain, combined with already saturated ground, overwhelmed the Albany-Millersburg sewer system in a couple of places. A lift station was damaged in Millersburg, and in Albany the system discharged untreated but diluted wastewater directly into the river at one of the spots where regulations permit it under these circumstances. These park residents had apparently hoped for a snack and were disappointed. 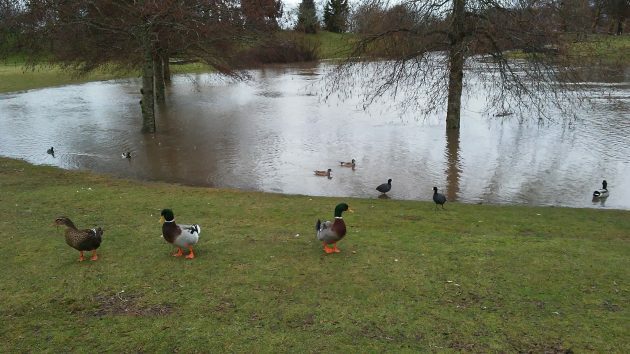 “The ducks don’t seem to care.” Good one HH. Water is a basic need. Too much water. Meh. Under normal times, I would make a climate change comment but I’ll spare you. Why do we allow any raw sewage to spill into our waterways? Even in high water times. Easy way out? Now, turn to the unfolding and unmitigated disaster that is the 45 administration. With the stroke of a pen today (2/16/17), he struck down the “Stream Protection Rule”. Coal miners can, once again, freely dump waste into waterways. Surely, the ducks and all other living entities should care about their lives. Right! And put diapers on the fish, ducks, nutria….. Please leave national consideration out of this site. I choose the example of “the Watergate imbroglio”. So thank you, Centrist. Leave national consideration out? Not sure that is wise in these times.